Fire Safety Solutions NI provide fire risk assessments that will ensure you are legally compliant, fully insured and protected from the risk of fire. A Fire Risk Assessment evaluates your premises in terms of fire safety and risk to life from fire. It must be carried out by a competent person, defined as someone who has suitable and sufficient training and experience in fire safety to allow them to carry out the role effectively. A fully qualified and accredited fire risk assessor will visit your premises, make a detailed physical inspection and review your fire safety records. We will then provide you with an easy to understand report on-line or in paper format and arrange a suitable time to review and fully explain the report at your premises. The report will include a prioritised action plan on how to minimise the risk of fire to your business. 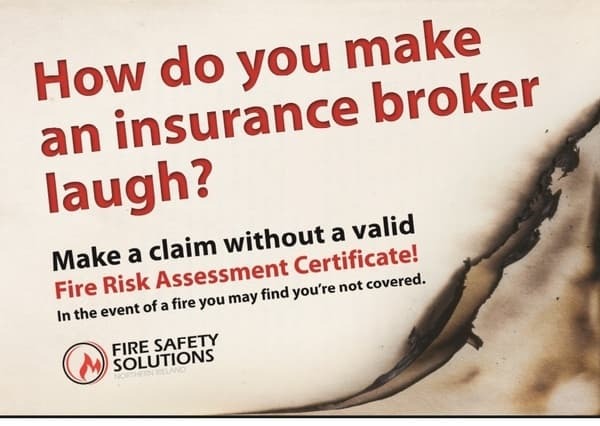 If your Fire Risk Assessment is not suitable and sufficient your insurance company may not pay out following a fire incident. Prices start from only £149 for small sites including the on-line management system, logbook and follow up visit to fully explain the report. For a free site visit and no obligation quote please contact us on 028 90 452297 or email us at office@firesafetysolutionsni.co.uk. Call us NOW on 028 90 452297 or email us at office@firesafetysolutionsni.co.uk.